That’s exactly what this country needs–more dead donkeys. I’m for that. The live ones make too much noise. I’d certainly not shed a tear if all the corruptocrats in office suddenly all fell over, and kicked the bucket. 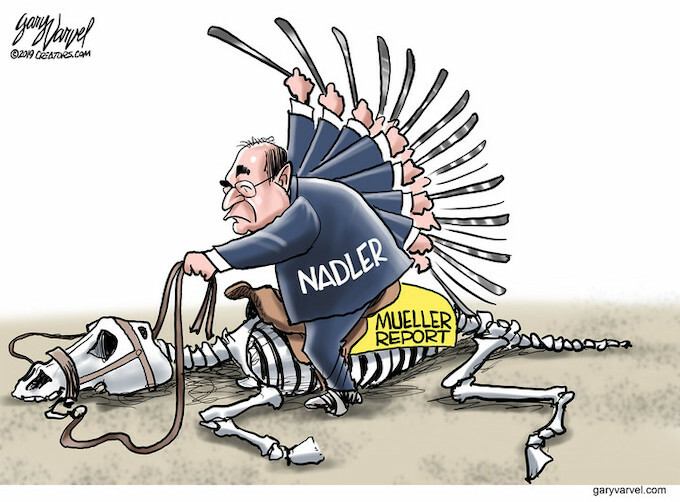 I’ve been saying since the Mueller witch hunt ended that the Dems will NEVER stop beating the dead horse of Russian collusion and/or obstruction of justice! What else are they going to talk about? The great policies they have proposed for the American people? The stellar economy that Obama built during his 8-year TRAINWRECK of a “Presidency?” Ha ha ha ha ha ha ha ha ha ha ha ha ha ha ha ha! So they keep pretending that against ALL logic, there is some deep, dark SECRET buried within the Mueller Report that will PROVE that Pres. Trump did . . . well . . . SOMETHING! And demanding to see Pres Trump’s tax returns–though I don’t see any of THEM offering to expose THEIR tax returns to public view . . . This is a perfect description of their character. They aren’t interested in finding out what’s in the report. They’re interested in reading between the lines and inserting their own hatred into the report as if it originated from Trump. Much like the Fake News always creating their own stories out of pure nothing instead of reporting on things objectively. Libs can’t eat an ice cream cone without inserting Liberal bias. Fata$$ Nadler has no other mission in this life – so let him be his own idiot.